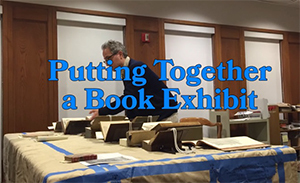 “Putting Together a Book Exhibit,” a video teaser for our 2017 exhibition in New York City, has won the Best Video prize in the American Association of Law Libraries (AALL) “Day in the Life” contest. The annual competition recognizes photos and videos that capture the spirit of law librarianship. The video was produced by my colleague and exhibition co-curator Mark Weiner (Yale Law School Class of 2000). It shows us preparing a section of our exhibition, “Law’s Picture Books: The Yale Law Library Collection.” The exhibition is scheduled to run September 17-November 18, 2017, at the Grolier Club in New York City. The exhibition will include over 150 volumes from our collection of illustrated law books. Thanks to all my AALL colleagues who voted for our entry, and a special thanks to Mark Weiner, whose artistry and skills were the winning combination. Mark is planning a much bigger video production for the exhibit itself. You can see all the “Day in the Life” winners on the AALL website, and view the video below. Putting Together an Exhibition from Mark S. Weiner on Vimeo.